I confess: right about now, I’ve had my fill of root vegetables, from parsnips, carrots and rutabagas, to turnips and black radishes. Yes, they’re locally available, in-season and tasty. But it’s been a long winter, and I occasionally long for a taste of warm weather produce. 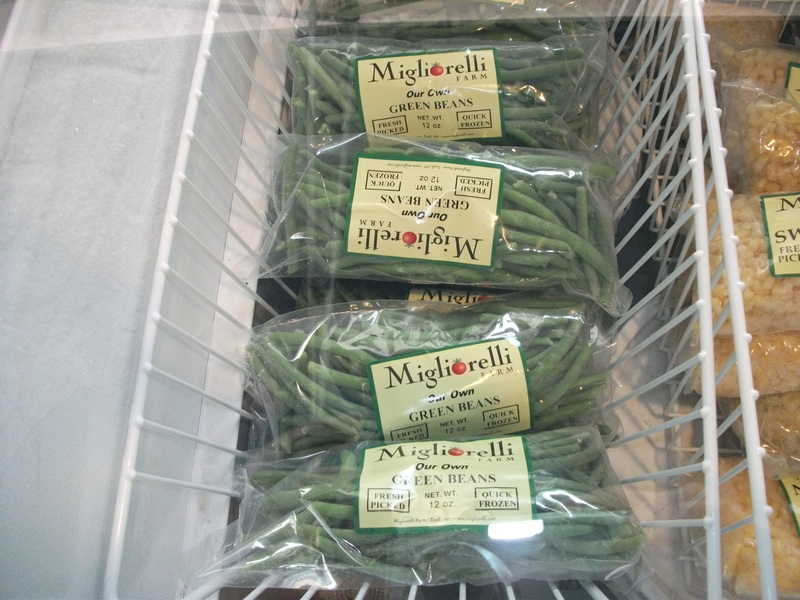 Now, my upstate neighbor Kenny Migliorelli offers an antidote to my winter vegetable blues with Migliorelli Farm’s new line of frozen produce. They debuted in mid-January at the Union Square Greenmarket. 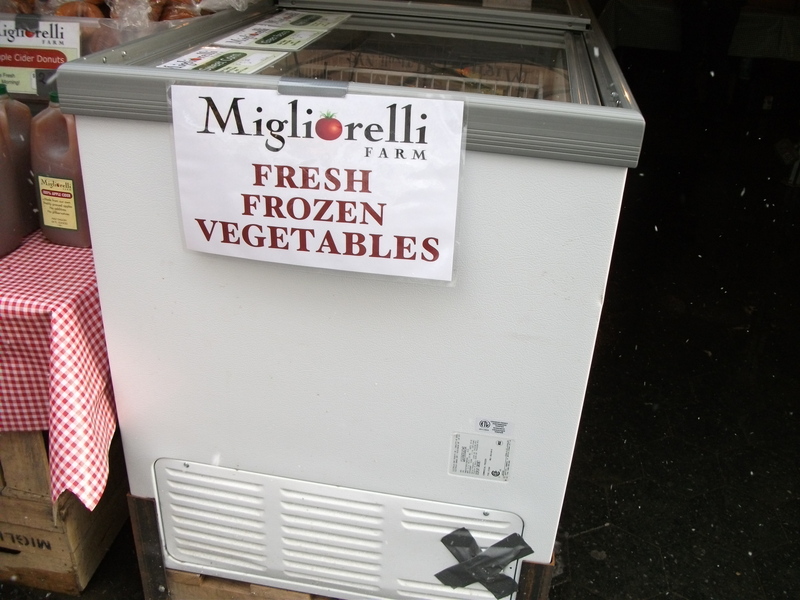 At the Migliorelli Farm stand, Kenny has repurposed a commercial ice cream freezer to hold and to display his frozen vegetables, which include bags of sweet corn; green beans; mixed red, yellow and green bell peppers; Brussels sprouts; kale; collards; mustard greens; broccoli rabe; and Italian flat green beans. Available in 12 ounce packages, they are $5.50 at the Union Square Greenmarket and $5 at select winter markets in the Hudson Valley, including Red Hook, Rhinebeck and Beacon. 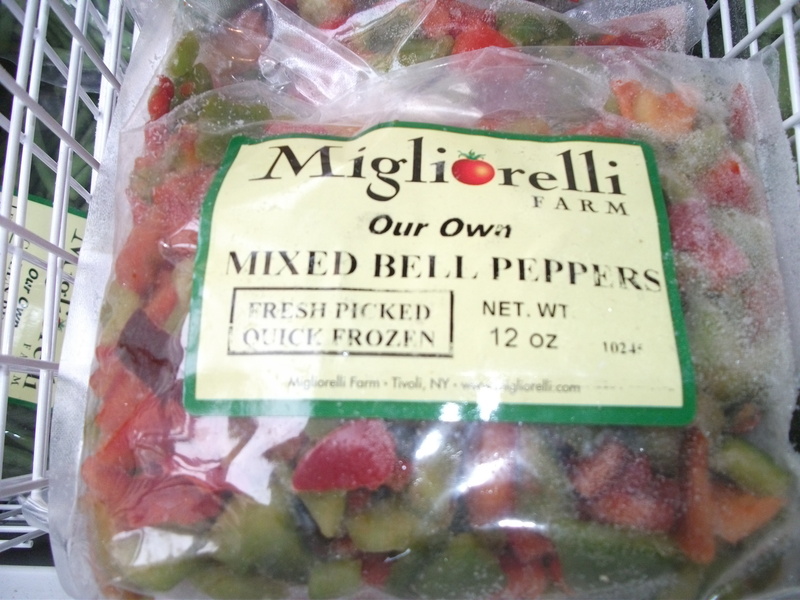 Migliorelli also sells frozen tomato puree (no additives or preservatives), $5 for 1-quart; $40 for 40 pounds. “The customer pays more for our frozen vegetables than they would for Bird’s Eye,” Kenny acknowledges, explaining his new venture. Vegetables were picked at optimal ripeness. 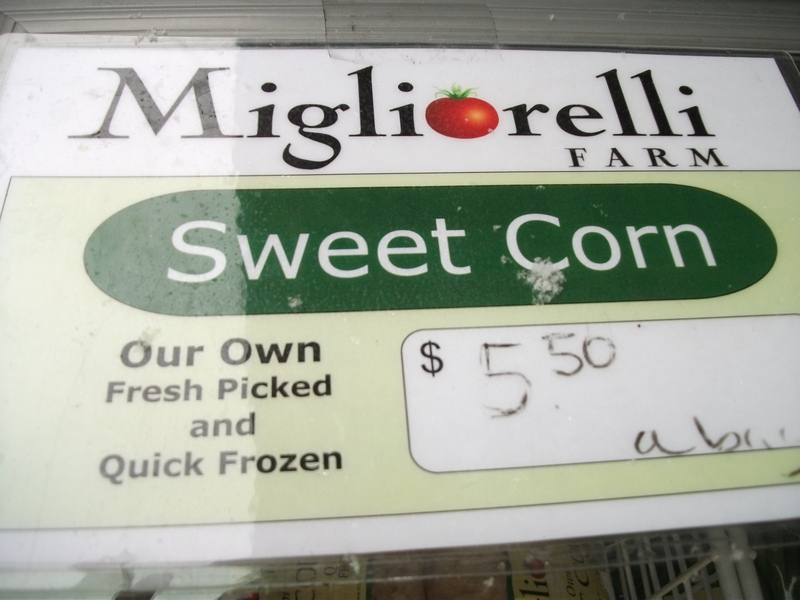 Last summer, Migliorelli harvested 2,000 pounds of sweet corn, 1,000 pounds of beans, 1,000 pounds of tomatoes and 400 to 500 pounds of various leafy greens to be frozen. Kenny works with Farm to Table Co-Packers, which packages fresh, locally grown vegetables in a 20,000 square-foot industrial kitchen, housed in a former IBM plant, in Kingston: “We blanch the vegetables; the co-packer packages and freezes it.” It’s pure frozen vegetable—no additives; no preservatives and no salt. Because Farm to Table offers only packaging services, Kenny stores the final product—his frozen vegetables—at another facility. And that’s the cost passed onto the customer for fresh vegetables, picked and frozen at peak flavor. For a long time, I had presumed that frozen vegetables were less nutritious than fresh vegetables. But that’s not an accurate assumption. As produce advocate Fruits & Veggies More Matters points out, fresh produce that travels a long distance before arriving at a supermarket, where it can sit for who-knows-how-long before it is bought—all the while subject to dubious storage conditions—can lose more nutrients than frozen produce, which is immediately processed after harvesting. Frozen vegetables do, however, have a finite freezer life: eat them within 8 months of purchase. For local vegetable lovers, like me, it’s a win-win splurge. 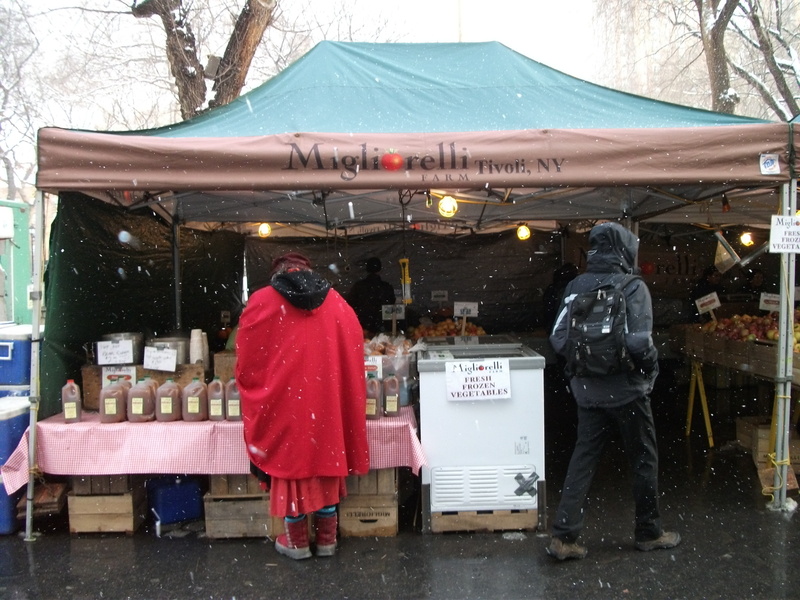 This entry was posted in Food, Health, Hudson Valley Farms, Local Food and tagged frozen vegetables and nutrition, Hudson Valley, Migliorelli Farms, Union Square Greenmarket, winter markets. Bookmark the permalink. Good for you, Erica. Happily, frozen fruits and vegetables (without additives), especially from a local grower, are “convenience” foods we don’t have to feel guilty about!